Friday: Email pcgs1892@gmail.com to request an appointment. The Library has a large collection of genealogical materials on Paulding County and surrounding areas. There are also Volunteers who will try to answer questions on Paulding County Family History. Everyone is welcome! 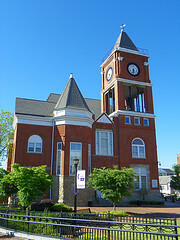 The Paulding County Genealogical Society meets the first Saturday of the month at 10:30 AM in Room 106 of the Historic Old Courthouse on the Square in downtown Dallas, Georgia. If that Saturday falls on a Holiday weekend the meeting is the second Saturday of the month. Visitors are always welcome!